Two years ago, upon graduating from Reed College, 22-year-old Roger Hobbs sent a manuscript he'd written while a student to an agent. Interest was piqued, a rewrite of the first 50 pages requested... and on the basis of those 50 pages, the agent managed to sell the novel in the US and to international publishers! The eventual book has recently been released in New Zealand and overseas. Quite the rapid rise for Roger Hobbs. 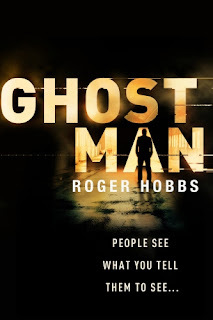 I have a copy of GHOST MAN on my shelf, and am looking forward to seeing what all the fuss was about. In the meantime however, here is an interview with the young debutant author, courtesy of his publishers. Q: What exactly is a GHOSTMAN? A: When a crew of criminals plans a heist, each person has a different role to play. There are probably a couple of roles you know already. The wheelman is the guy who drives the getaway car. The boxman knows how to open locks and safes. The bagman carries the cash and takes transportation risks. There are a couple you probably don’t know, either. The guy who plans the heist is called the jugmarker. The thug who carries the guns is called the buttonman. A ghostman can be useful in a myriad of criminal enterprises—identity theft, corporate espionage, armed robberies, bank fraud, drug distribution—and is responsible for anything that requires a disappearing act. In short, he’s an expert in the subtle and challenging art of getting away with it. His job is to make sure nobody gets caught. Q: When and how did you first get the idea for this novel? A: I first got this idea the summer between my sophomore and junior years of college. I was walking home late one night after a movie when I stumbled across an armoured car depot. Now, this doesn’t look like you think it should—it doesn’t have thick brick walls, rows of security cameras or a bunch of security guards sitting around playing poker. No, it looks like an office building with a bunch of armoured cars parked out front. Being naturally curious, I thought I’d have a look. I walked around for a bit and after a while, finally worked up the nerve to touch one. As soon as I did, I felt like I was struck by lightning. Instantly my brain was full of different ideas about how I could rob it. I must have spent an hour out there in the dark, examining every part of that car. I noted all the features and considered all the weaknesses. That night I went home and wrote the first chapter of GHOSTMAN. Q: Tell us a little about Jack Delton and how you developed his character? A: Jack is a man with an extraordinary, one-in-a-million talent: he is completely unmemorable. You could walk by him on the street every day for a year and never remember his face. He doesn’t have a name anyone knows, he doesn’t have a look, he doesn’t have a bank account. No credit card, no social-security number, no web profile. He’s nobody, and he’s anybody. If he needs to drive, he can be a driver. If he needs to fight, he can be a fighter. He can become anyone he needs to be in the blink of an eye. This talent—his unremarkablity—is the very first thing I ever knew about his character. I developed him as a person around this idea. What sort of things does a man with no identity do? What does he like? How does he go about his day? Jack is a tough guy and a hardened criminal, but I wanted my readers to sympathize with his unusual, and somewhat melancholy, existence. Q: You wrote this novel while in college and in fact sent it to your (now) agent on the day you graduated. When did you start writing and were you always drawn to crime stories? Q: Okay, you obviously know an awful lot about staging a heist—starting with how the Fed prints money and transports and safe-guards it in armoured trucks, to guns and explosives and how the person driving the getaway car plots the best escape route. How did you learn about these things? A: First things first, I should say that most of the things you need to know to become a world class criminal mastermind are on the Internet. It isn’t stuff you can just put into Google, but it’s there if you know where to look. There are hidden sites on the deep web with forums on every criminal topic you can imagine. Blow up a car? You got it. Bloodstain pattern analysis? A whole course. Disable a silent alarm? Absolutely. Most of the research I did for GHOSTMAN happened while I was sitting right here in front of this pale blue glowing computer screen. But not all of it. The Internet could only get me so far, so I went on a lot of field trips. In order to study the monetary process, I toured the Bureau of Engraving and Printing in Washington, where I was allowed to walk around and observe hundreds of millions in new bills get ready for circulation. I went to dive bars all around the country where I interviewed active criminals and traded secrets for cigarettes. I did a two-week training course with the NRA out in the mountains to learn the inner workings of firearms. I taught myself to pick locks and hotwire cars in the parking lot of my dorm block. I exchanged emails with a professional forger in the UK who specialized in passports and Eastern European driver’s licenses. I talked online with a working hitman. Of course not everything in GHOSTMAN is accurate, but I did my best to make it all feel real. Q: What did you learn in your research that surprised you the most? A: The most surprising thing I learned in the course of my research was just how rare intelligently committed crimes really are. A world-class crook might pull off two large-scale jobs in his or her entire life, because anybody with the brains to plan a complicated, successful heist could make twice as much money in half the time by dealing drugs instead. Also, bank robberies have an astoundingly high chance of getting solved by the police second in fact, only to murder. Q: Are you really 24 or are you a really good ghostman yourself? A: Part of me wants to be a ghostman. I think everyone, at one point or another, has wanted to do what Jack does. Everyone has fantasized about getting up and leaving and never coming back. A ghostman is a living incarnation of that fantasy. His identity is fluid, so he can change himself to fit any situation. Whenever things get too hairy, or a little boring, he can sever all ties, pack a few things in an overnight bag and fly off to another part of the world. He can start over again as many times as he wants without any consequences. Of course there is a high price for this lifestyle. A ghostman can’t celebrate Christmas at home with his family, or make friends, or fall in love. The ghostman wakes up every morning and chooses who he wants to be, but as a result he can never become anything more than what he already is. Q: So what’s next for you? Without giving away the ending of the book can you tell us if we’ll see any of the characters from GHOSTMAN again? ABOUT THE AUTHOR: Roger Hobbs is 24 years old and completed the first draft of this novel while still a senior at Reed College. He has worked as a radio host, a rifle range instructor, a note-taker and a security guard. He is a recent graduate of Reed College. He lives in Portland, Oregon. I loved this book, was awestruck to think someone so young had so much talent, and I am sure it will be one of my top reads for this year. It will be interesting to see if he has used everything in this book, or will he be able to maintain the thrills for any subsequent books he writes. Great interview, amazing what you can find on the internet! thanks for your comments,and also give me a information.